Woodland Villa resident Muriel VanAllen and staff member Karen Brennan stop by a Tim Hortons drive-thru for coffee on the home’s new Triobike. Woodland Villa introduced the local community in Long Sault to its latest innovative venture: a Triobike that will help residents of all physical abilities go into town for a safe, enjoyable bike ride with others. The home hosted a gathering on June 26 to introduce people to the Triobike, which was purchased this past winter after staff members attending a conference learned about the positive results the bikes were having for seniors. There is also a plethora of positive reviews on social media and online posts about the benefits of Triobikes, notes Woodland Villa administrator Janna Sabourin. The Triobike is a three-wheeled bike with a two-seat carriage at the front. Janna says Woodland Villa made the Triobike launch a public event to demonstrate the great things the long-term care home is doing to enhance quality of life for residents. Attendees at the launch included Stormont-Dundas-South Glengarry MPP Jim McDonell, South Stormont Deputy Mayor Tammy Hart and town councillors. Since purchasing the Triobike, Woodland Villa has become an affiliate of the organization Cycling Without Age, which began in Copenhagen in 2012. A representative from the organization also attended the launch. While the Triobike will mainly be used by the life enrichment department, Janna says volunteers and family members are also welcome to take residents out for a ride. 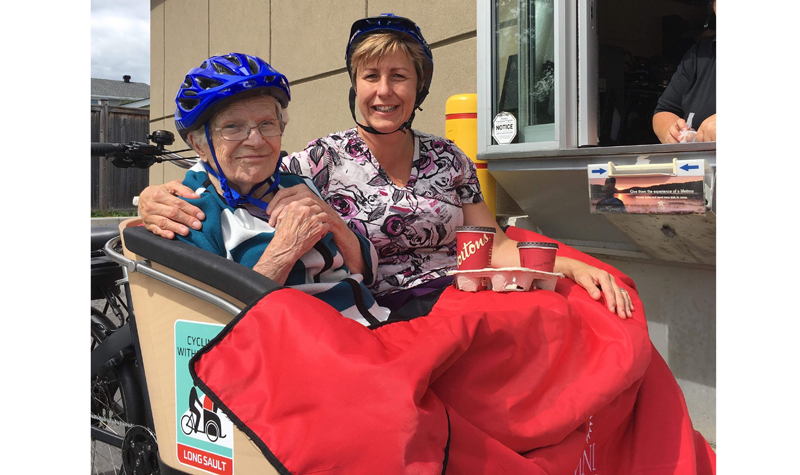 Recently, resident Muriel VanAllen and staff member Karen Brennan visited a local Tim Hortons drive-thru on the Triobike to grab a coffee. “We want to promote this as much as possible to get others to be involved,” Janna says.